Escape the daytime chaos of Rome, and discover the Eternal City’s more romantic side on an after-dark Segway tour. Start by the enchanting turtles’ fountain in Piazza Mattei. 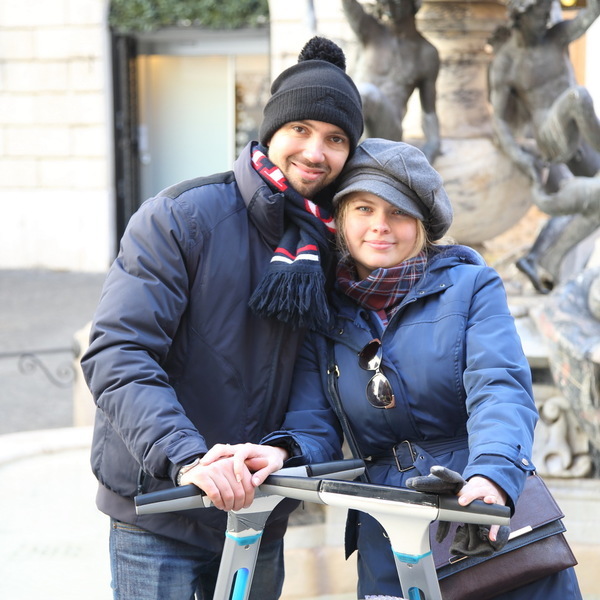 After a short training session to ensure you feel safe and comfortable on the Segway, make your way through the Jewish Quarter to the medieval Campo de’Fiori. Cross the River Tiber to the Castel Sant’ Angelo. Then, make your way towards the Vatican City and the illuminated façade of St. Peter’s Basilica. Continue to Piazza Navona, going to the temple of all gods at the Pantheon. Admire the best-preserved building of the Roman Empire. Continue to the Trevi Fountain, where you are free to throw a coin in the pond. Admire the Altare della Patria (Altar of the Fatherland), erected as a monument to the first King of Italy. Cruise up Capitoline Hill for a captivating view by moonlight. The tour is limited to 4 participants for a more intimate experience, and is a perfect romantic tour for couples.